The Black Cuillin is the home of scrambling in the UK, with a lifetime of different routes to explore. Scrambling routes involve the simplest form of rock climbing and mark the cross-over from hill-walking to climbing. The thrill of moving confidently whilst in exposed positions makes it a very popular activity. An explanation of what scrambling entails can be found on the Scrambling Information page and an idea of what to expect on the Why Choose Skye Guides page. Contact Us to discuss what type of outing is suitable for you. 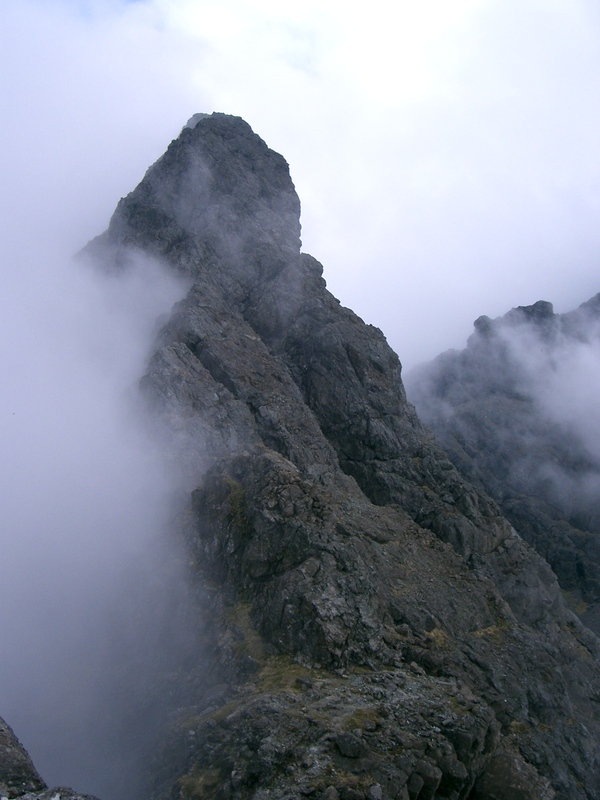 “…The ridges provide continuous challenges and the only limitations are the climbers own ability or fitness.” Skye, The Cuillin introduction. Discover the excitement and fun of scrambling with the guidance and instruction of our professional guides. We appreciate the wide variety of abilities and the itinerary is always flexible. An example of one of our many routes and the variations possible is detailed below. Book a single day if you want a safe memorable addition to your vacation or a longer course if you really want to enjoy and explore the Cuillin more fully. Extra days are easily arranged and booking alternate days to give a rest day is no problem. 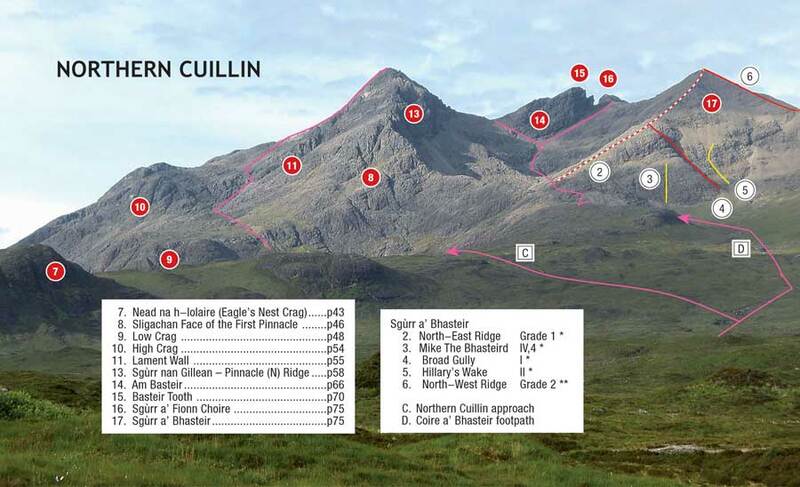 The route below is an example of our introduction to Cuillin scrambling that you should be able to follow on a map of the area (Harvey’s Skye The Cuillin is the best). If you are confident in your own scrambling abilities please feel free to use the description to explore yourself. From Sligachan follow the footpath to the Bhasteir Gorge (1.5hr). Ascend the NE ridge of Sgurr a’ Bhasteir (route 2 on this picture) then traverse horizontally into the main ridge at Bealach na Lice (1.5-2hrs). From here the simplest outing ascends Bruach na Frithe (10 mins) before decending NW to Bealach a Mhaim and returning to Sligachan (2hrs). This isn’t a fast pace but doesn’t include breaks at all so 6-8 hours is likely. In good weather a more adventurous client can climb the Basteir Tooth, Am Basteir and Sgurr nan Gillean by some rock climbing and very exposed scrambling. Previous experience isn’t necessary and fitness is the only prerequisite. There are no disappointing scrambles in the Cuillin but some routes are considered as absolute classics. The technical difficulty involved is never too great with our guides knowing the best lines on the routes. Again, no previous experience is necessary and fitness is the only prerequisite. How do you tackle that safely? Knowing how to use a rope safely in different scrambling situations is a different skill to using ropes for rock climbing but they are the same skills needed for tackling mountaineering routes in the Alps. Our training is kept very simple and practical so that using a rope is a comforting thought rather than a daunting prospect. The primary lesson is in using a short length of rope to safely tackle short exposed steps of which there are so many in the Cuillin. Descending and ascending these is covered well before more complex issues such as setting up abseils. Key to the teaching is working as a team and building both trust and confidence in each other. These courses are particularly useful if you regularly go into the hills with the same person. 2 people on the rope is ideal to start with but coping with 3 or more can be covered. 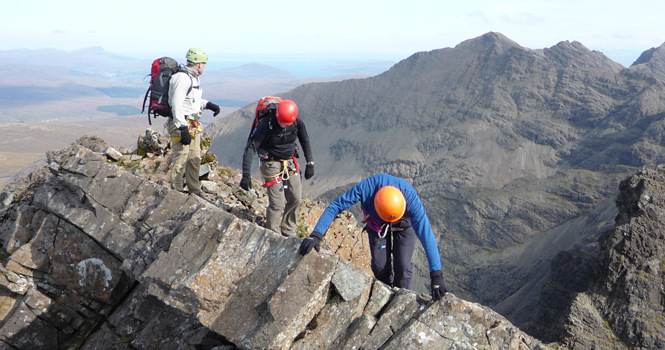 Some clients take a day or 2 of instruction and then use their skills to tackle Cuillin routes themselves; we really encourage this and give plenty of advice and are only a phonecall away if questions arise. More specific alpine training including setting up hoist systems to rescue people, glacier travel, prussiking etc can all be taught for anyone planning a continental trip. Black Cuillin Prices 2019. Daily rates for private guiding. Harness & helmet use included in prices.